Wednesday September 4th 1878 Hatt ironed this morning and I did a little more sewing. About ten oclock Rob and I went to town in the buggy and selected a lot of new furniture. It was brought over in the afternoon and we did some-thing at the house-cleaning. We got quite a start up stairs. I sewed in the evening. 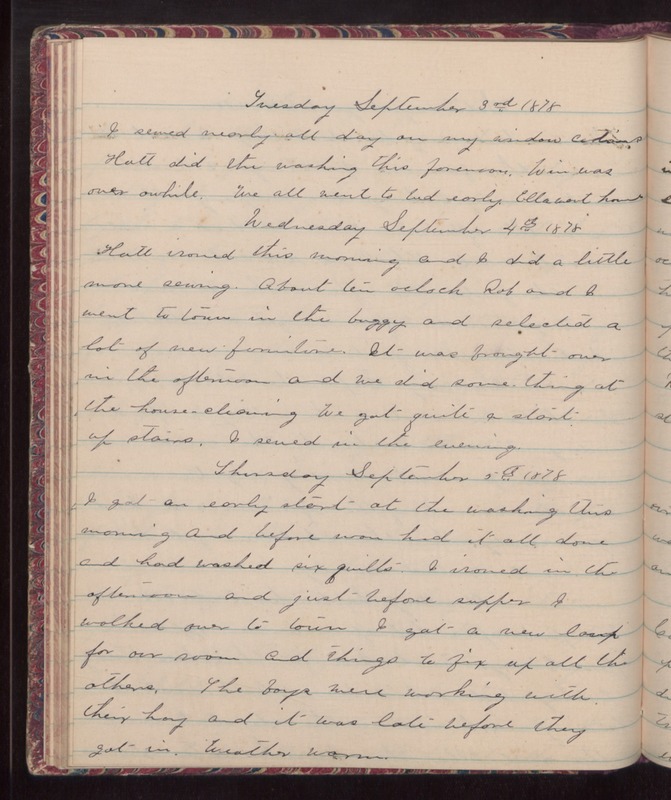 Thursday September 5th 1878 I got an early start at the washing this morning and before noon had it all done and had washed six quilts. I ironed in the afternoon and just before supper I walked over to town. I got a new lamp for our room and things to fix up all the others. The boys were working with their hay and it was late before they got in. Weather warm.